Currently finishing work on their upcoming album, Killswitch Engage have taken a break from recording to embark on a summer European tour with Iron Maiden. The trek will also see the band appear at various premier festivals (Sweden Rock, Graspop Metal Meeting, Hellfest, etc. ), along with a few special headlining shows. Then, in the fall, the band will be touring across Australia with Parkway Drive. See below for all dates! 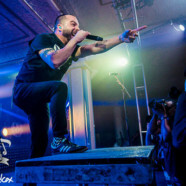 Twice Grammy—nominated, Killswitch Engage has sold over 3 million records worldwide, with The End of Heartache and As Daylight Dies both certified Gold in the U.S and Silver in the UK. The band’s latest album — 2016’s Incarnate — landed at #6 on the Billboard Top 200, #1 on the Current Rock Albums chart, and debuted at #1 overall in Canada, #5 in Australia, and #10 in both the UK and Germany — a testament to their international reach.